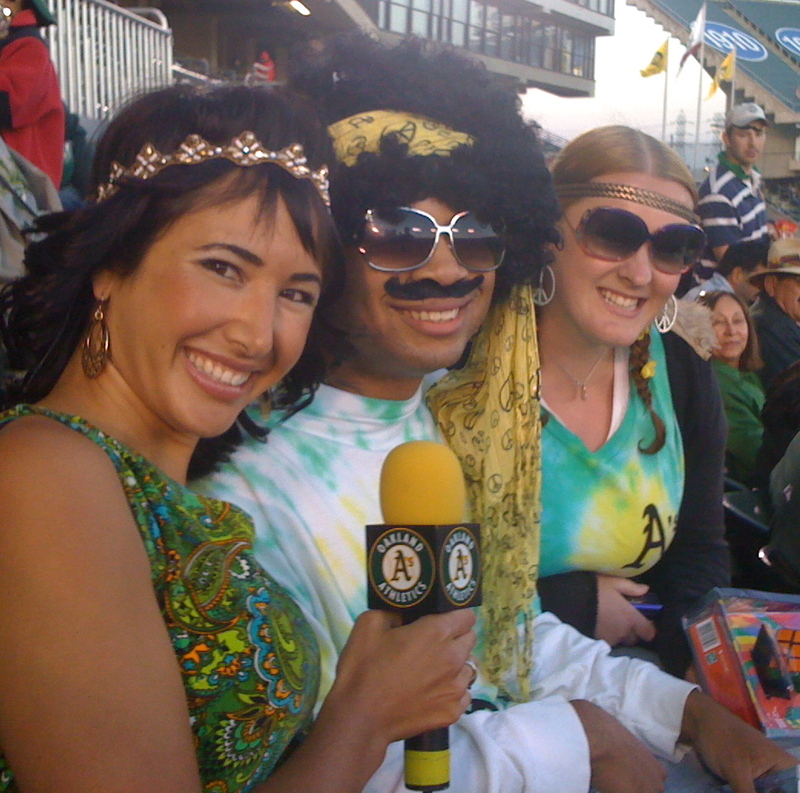 From an energized crowd to the 1970s inspired costumes (both on and off the field) to a satisfying win against the Pittsburgh Pirates, throwback night at the Coliseum was a wild success. was a lot of love coming from the stands too. I had a lot of favorite moments from the night (Saturday, June 26, in case you missed it) and tried to capture some digitally. 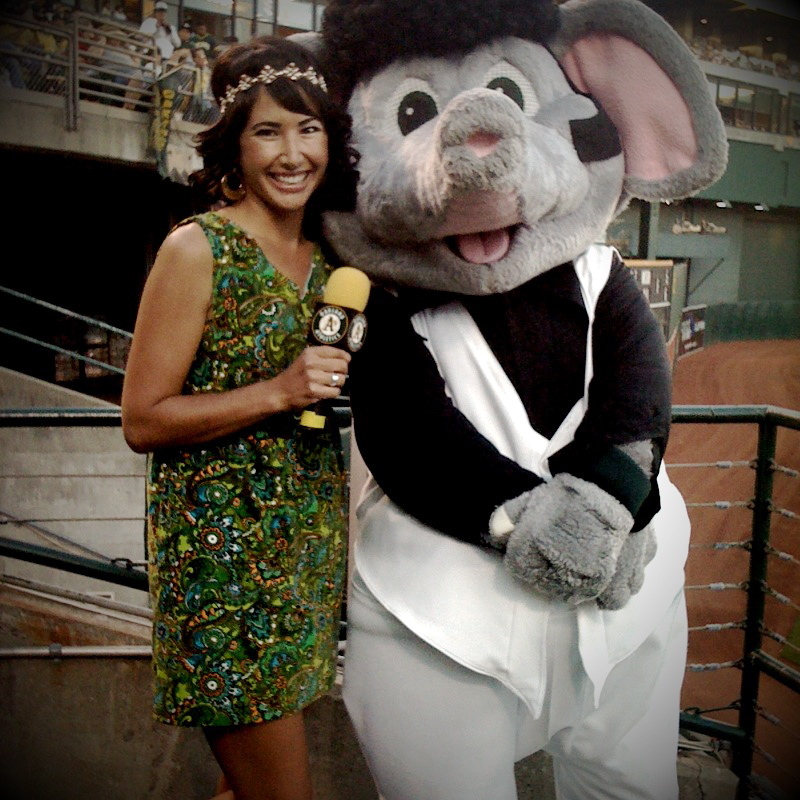 Above, posing with Stomper who wore one of the grooviest costumes in the Stadium. Inspired by “Saturday Night Fever,” this elephant had the bell bottoms and sideburns look down. And speaking of costumes, there was much ado about choosing the right looks for me to wear. In the end, I choose two outfits I already owned. My mom sewed the green dress back in the 70s, so it’s a true vintage piece. 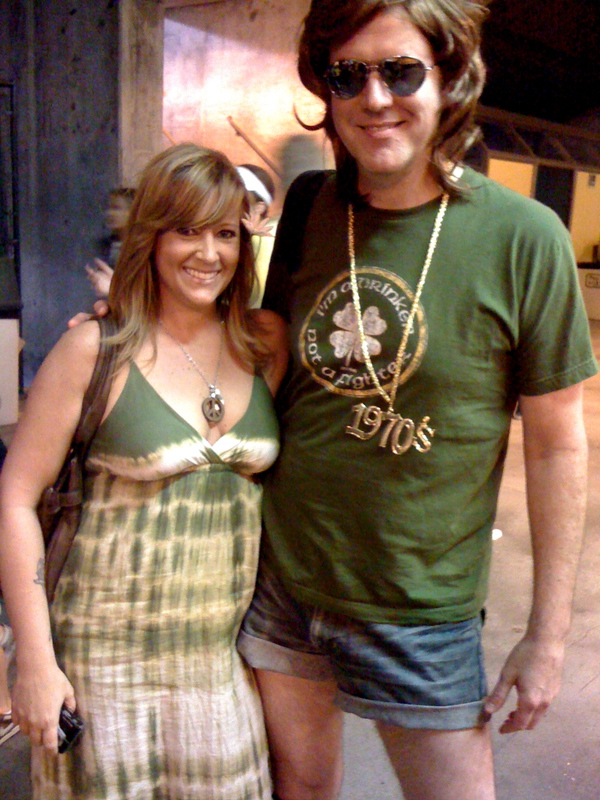 The two-piece yellow number also dates back to an earlier, uglier time… And for the record, I was wearing a wig that night — that is not my real hair! 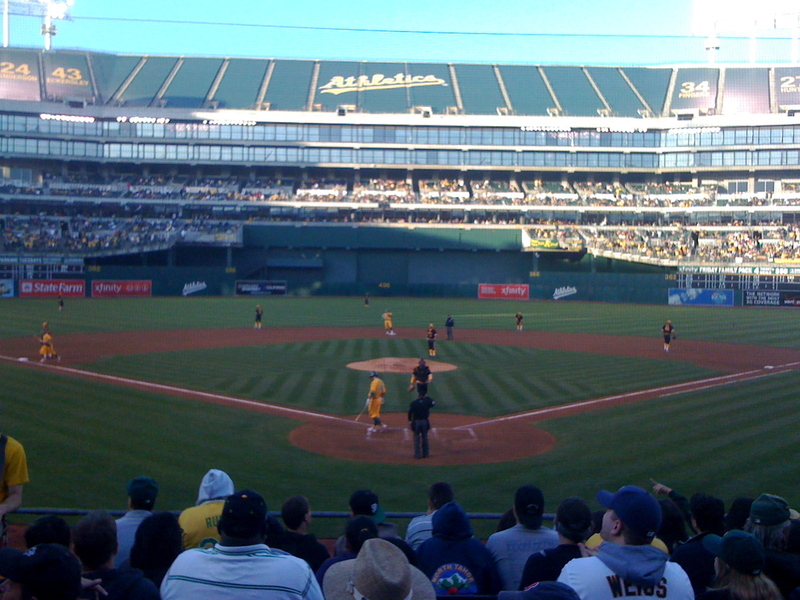 Right, snapping a pre-game photo with the one and only Glen Kuiper, the A’s television announcer. Love the wig, the jacket and the ability to not take yourself too seriously!! The same can be said about Vince Cotroneo, Left. As one of the accomplished A’s radio announcers, this guy may not get television air time, but wow — that’s quite an outfit. And again, I love how different 70s hippie is from 70s corporate businessman. Two great looks from one era! 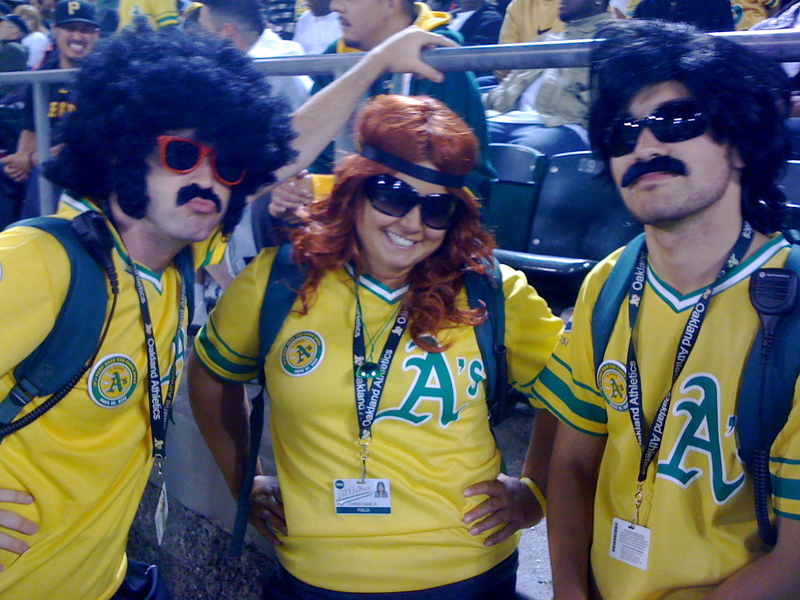 Above right, Mark, Christiane and Matt from the Herd show off their wigs and ‘staches. Their enthusiasm was infectious that night! 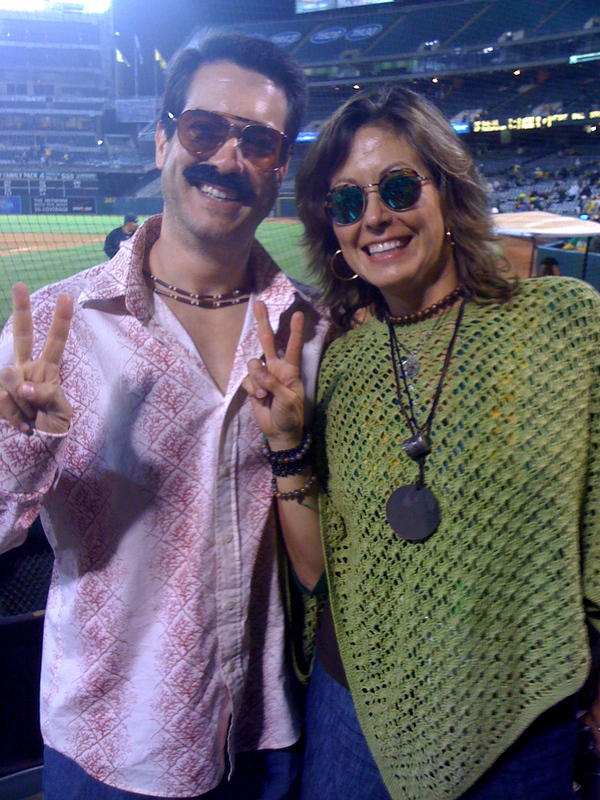 One of the most satisfying parts of 70s night was spotting fans who took the time to dress up. Whether it was a righteous ‘stache and chops combo, an outrageous wig, homemade tie-dye or true vintage duds from the back of the closet, it was all groovy! 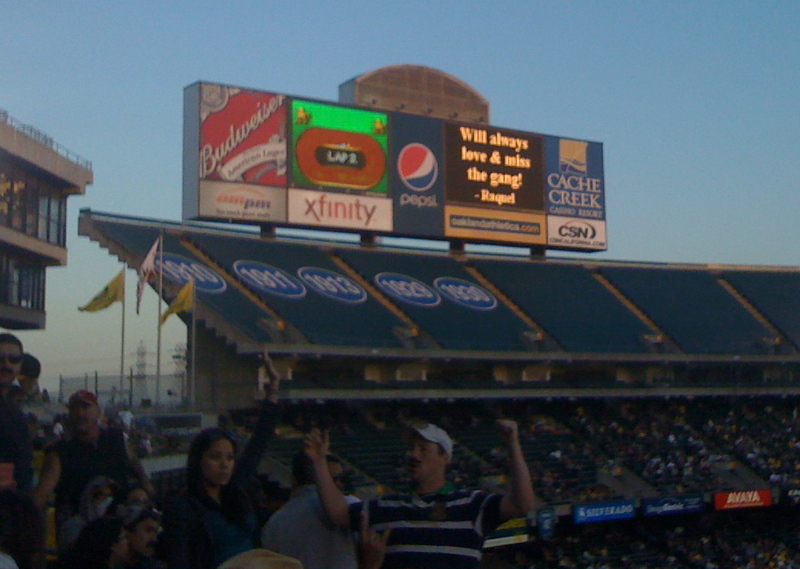 Finally, the in-stadium entertainment that night was particularly far out! The music was fun and funky, and I loved seeing the player’s zodiac signs on their headshots every time they came to bat. 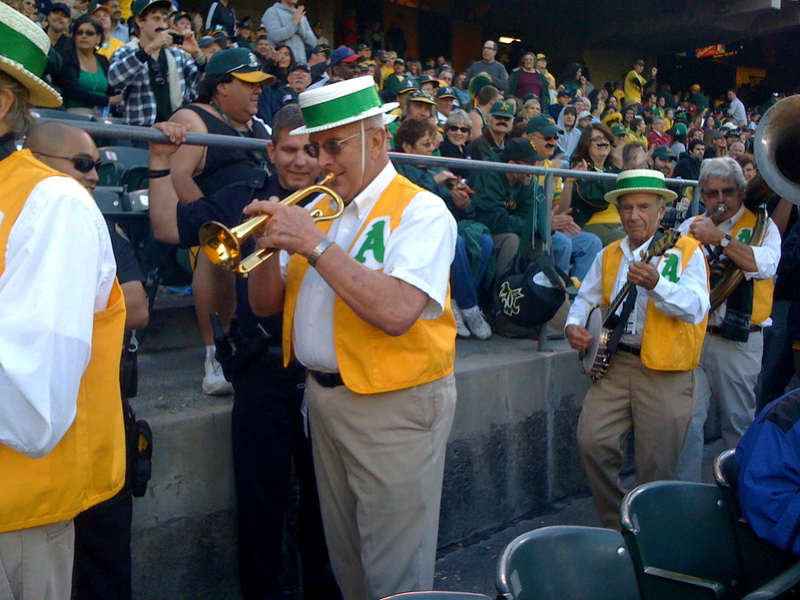 Other highlights include the Swingin’ A’s straw hat band that used to play regularly in the Coliseum back in the day. We should bring them back more often! Another hit with the fans was the old school dot racing game from that decade. Wow, we sure have come a long way with technology!